In the US alone, there are nearly 29 million small businesses, everything from food trucks to clothing boutiques to a castle that sells cheese. And while you hear a lot about the Googles, Apples, and Amazons of the world, we figured it was high time to highlight a few lesser-known brands carving out their own success. While they may seem (relatively) small now, they’re all poised for some rapid expansion in 2018 -- so don’t be surprised if, by December, a few are household names. If a typical tailgate includes your friend’s truck, a pack of hot dogs roasting on a portable grill, and a 30-pack of beer, Blockparty is a definitively VIP version of that. Think premium seating areas kitted out with tents and lounge furniture, music, and games -- plus a crew to take care of all the set-up and clean-up, so you can just enjoy the atmosphere. CEO Adam Ward, 35, a former management consultant, and COO Steve Gilman, 32, who played minor league baseball before getting his MBA, launched the Dallas-based hospitality brand in 2015 by building pop-up fan suites out of repurposed shipping containers. That initial buzzy concept expanded as the business grew to partner with collegiate football programs, Live Nation music amphitheaters, and pro teams like the Milwaukee Brewers and United Soccer League. “[The shipping containers] got us a lot of attention, and it’s novel, very brandable,” Gilman says. “What we soon realized was hospitality goes well beyond what we could facilitate with those containers. To build a national, scalable model, we’d have to build a brand around using commodities in the industry, but also having our own model.” Nowadays, they use tented products, high-end furniture, and A/V equipment, all of which can be customized for brands. "...if we lose tailgating, then we’ve lost all genuine experiences." Blockparty’s college football packages range from $30-$60 per head for a 30-person group (which includes a premium area and tailgate fixings -- furniture, ice, valet service, tent); bowl games can be upwards of $200-$250 per person (including food, beverage, and open bar); and at Live Nation concerts, Blockparty is a $35-$70 upgrade to the ticket price. 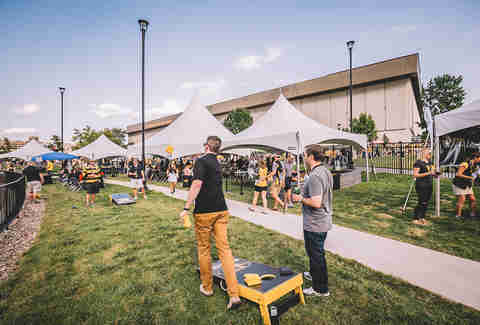 Tailgates usually feature live music, a game zone, and a kid-friendly area. The immersive experience is designed to keep people excited about tailgating in a time when technology beckons them to spend more time online or catch the game on their big-screen TV at home. Thanks in part to a $2 million investment last June, Blockparty is set to quadruple in size in 2018 in terms of revenue and their number of multi-year partnerships. They’re currently in four Live Nation amphitheaters with plans to scale to 12 more next year, and have ramped up their campus presence. “We went from no technical partners in that realm to 16 partners now in the collegiate space,” Gilman says, counting eight new schools for the 2018 season (including Louisiana State University and NC State). And they’re not done yet -- in addition to signing more colleges, Blockparty is next eyeing music festivals, the NFL, and more MLB teams. Peter Mack was just 15 when he started working in the hotel industry as a dishwasher, trying to earn enough cash to afford his first car. From that moment, though, his love of traditional hotels and the hospitality industry was solidified -- so much so that he went on to spend 10 years with Starwood Hotels & Resorts, working on everything from sales marketing to operations to development. In his work, he spent a lot of time at hotels -- as in 250-nights-on-the-road-in-one-year kinda time. That experience taught him that the hotel industry was ripe for disruption: “People don’t travel because they want a nice bed, a shower, and some shampoo,” he says. “They travel to accomplish something, or connect with a special place, or connect with others.” That’s why he started the luxury camping business Collective Retreats in 2015, building out the tents himself and serving as host and general manager at their first location in the Vail countryside, which is surrounded by a 1,000-acre working ranch where guests can ride horses, hike, or taste local wines made onsite. "This is exactly the way I want to travel,” adds Cristina DeVito, who joined the business in 2016 to oversee operations. “I really believe in the model we’re building, and that it’s very disruptive to the hospitality industry, in a very positive way for travelers." "People don’t travel because they want a nice bed, and a shower, and some shampoo." 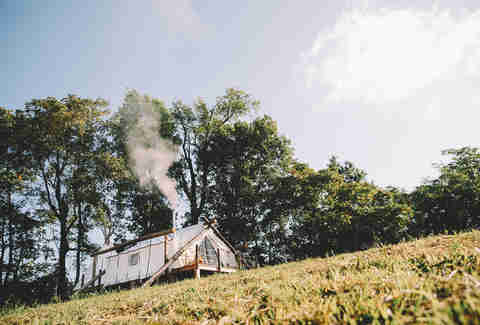 Based in Denver, the company operates five such untraditional “glamping” retreats across the US -- at Vail, on a working farm in the Hudson Valley, on a 225-acre ranch in Texas Hill Country, on New York City’s Governors Island, and within Big Sky’s Moonlight Basin at Yellowstone. What they all have in common: a traditional hotel would be impossible to operate there. And while their rooms may be in tents, Collective Retreats is certainly not expecting guests to “rough it.” These “tents” have running water and electricity, their own en suite bathrooms, king-sized beds with 1,000 thread-count sheets, and French press coffee delivered each morning. Each retreat also works with an executive chef to prepare locally-sourced dinners and provides concierge services to set up activities like riding ATVs or fly fishing. That, of course, comes with a price. Rates currently range from $500-$700 a night, though they’ll soon be rolling out a less expensive option at all of their properties, for customers who have expressed interest in a communal camping style at a more accessible price point. At the end of 2017, Collective Retreats also raised $10 million in investments -- so Mack says to expect several new locations to debut within the next year, including their newest spot inside a vineyard in Sonoma (set to open in 2019 and already taking reservations). Lastly, there are plans to take Collective Retreats beyond tents, too. Though Mack wouldn’t elaborate, previously, Travel Weekly reported that Airstream trailers and tree houses were possibilities. Overall, the pace that Collective Retreats is hosting traditional vacationers, family reunions, elopements, and honeymoons is proving to Mack that his concept of authentic, experience-heavy lodging isn’t just the future of hotels, but the future of travel -- a feeling he first got checking in the retreat’s very first guests, a family struggling to reconnect. “Seeing how much joy their experience brought them in the first three nights really propelled me to understand what we are doing here is not something small,” he says. Feeling inspired to start your own small business? 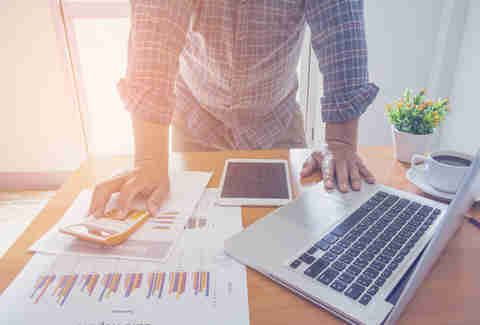 FirstBank offers business accounts and a variety of loan products including credit cards, acquisition or expansion loans, and lines of credit to help your company thrive. With your business’ financial well-being set, you’ll be free to focus on what matters most: taking over the world -- err... we mean industry. Certain requirements and restrictions apply. Member FDIC. You know the feeling -- it’s 3pm and you haven’t been able to escape the office to grab lunch, or you’re in need of a mid-afternoon energy boost. But the only sustenance within a quick walk of your desk is a vending machine stocked with salty and sugary junk food. Farmer’s Fridge wanted to change that. The Chicago-based healthy vending machine company opened its first fridge in Garvey Food Court in late 2013 with the mission to provide affordable, freshly-prepared, restaurant-quality food in a convenient format. Founder and CEO Luke Saunders, 32, was inspired to create the brand after working as a sales rep for a metal finishing company, where he drove 1,000 miles a week and was lacking options for healthy meals on the road. "[THE FORMAT] IS NOTORIOUS FOR SOMETHING THAT SHOULD NOT BE GOOD." So he leveraged his manufacturing background to create Farmer’s Fridge, where meals (breakfast bowls, salads, sandwiches, snacks) are prepared overnight at the company’s kitchen in the Fulton Market District, packed into plastic mason jars, then delivered via temperature-controlled vehicles to the fridges every weekday morning (some get stocked on weekends, too). 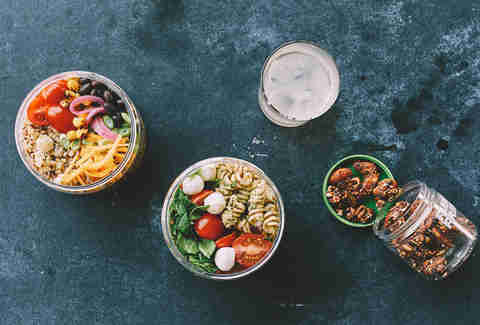 The menu includes ingredient-forward items like a smoked cheddar cobb salad, tarragon chicken salad sandwich, cauliflower fried rice bowl, and pineapple coconut chia pudding -- at prices more competitive than your local tossed salad joint: $7-$8 for a full salad (add-on proteins are $2-$4 extra), $4-$6 for bowls, and $4 for a half sandwich. Until late 2015, you couldn’t find an Instagram-worthy donut in Miami -- a fact that seems ludicrous to anyone living in another major US city. It seemed pretty crazy to Amanda Pizarro, 28, and her husband, Andy Rodriguez, 30, too, who opened The Salty Donut as a pop-up, operating out of an Airstream trailer in the hip Wynwood neighborhood two and a half years ago. Neither spouse had technical baking experience, or formal training in the food industry, period. Rodriguez spent his twenties as a serial entrepreneur and Pizarro had just graduated college with a degree in marketing. 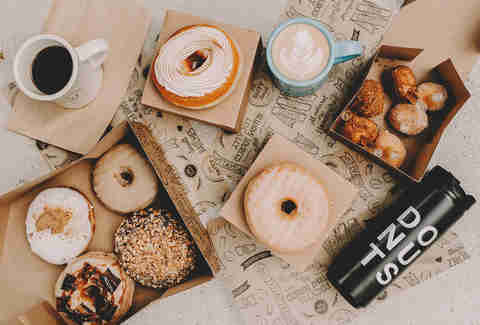 So, they teamed up with pastry chef Max Santiago (who has since moved on) and gave Miami its first taste of craft donuts: year-round flavors like maple bacon and the Cuban-inspired guava and cream cheese, and weekly, seasonal options like a grapefruit and strawberry brioche. (There’s even a booze-spiked donut hole.) Besides the unique flavors, each pastry is decorated into a piece of edible art -- which has earned Salty over 137,000 Instagram followers. “If I go back and look at our business plan originally, we definitely blew by that,” Pizarro says. After opening the pop-up, Salty participated in the South Beach Food and Wine Festival and won the Cooking Channel’s Sugar Showdown. By 2017, it found a permanent home in the Wynwood Arcade and in November, Pizarro was named one of Forbes’ “30 Under 30” in the food category. (Not bad for someone who was initially so unsure about her career path, it took her seven years to graduate.) 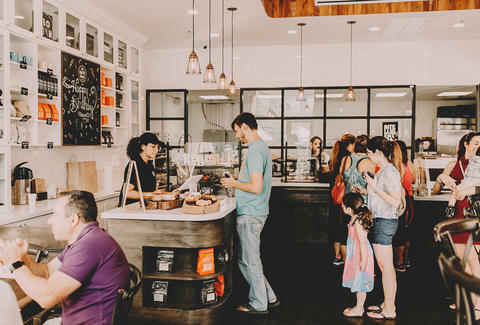 Now, she’s poised to launch a second Miami location in the upcoming months, as well as three other Salty Donut locations across the country (possible markets include Austin, LA, and New Orleans) -- all of which she plans to open by 2019. You may have heard of Zume -- the company founded two years ago that’s poised to disrupt the food industry with its pizza-making robots. It’s a Mountain View, California-based startup that sounds like a punchline on Silicon Valley (and yes, their pie even made a cameo on the show). But the business isn’t just some tech-y phenomenon. Though they’re starting with pizza, founders Alex Garden, 43, (whose background includes everything from game development to parking technology) and Julia Collins, 39, (the food industry veteran behind New York’s Mexicue and The Cecil) have much bigger plans than just overthrowing the Dominos and Pizza Huts of the world. Instead, they want to use their automation technology to improve the lives of food service workers not just at their company, but throughout the entire industry. Let’s break down what they do: Before any robots get involved, Zume uses a proprietary algorithm to predict how many pies (and which types) will be ordered on any given night. Then, the four pizza robots get to work preparing those pies at their central kitchen. They are parbaked just enough to get loaded into one of Zume’s delivery trucks, which are outfitted with special pizza-cooking ovens that bake the pies at around 800 degrees en route to customers. The result? A fresher delivery pizza, at your door in as little as five minutes. By the end of 2018, Zume will be available in 26 trade areas (compared to three currently), equal to half of the San Francisco Bay Area -- and it has already secured $48 million in funding for the expansion. 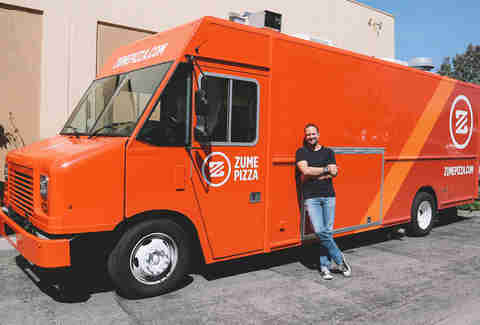 In April, the brand also founded Zume Inc., an umbrella company that will allow its executives to collaborate with companies looking to get into the food truck game and provide their technological know-how (ordering algorithms, robots, automated ovens) as a platform for other eateries. “[Our] approach is applicable to basically every type of food in the US,” Garden says. “We think this is something that could help restaurants, on-demand delivery companies, big national chains, and it helps customers and employees.” So, if by December, you find out your favorite delivery pie was actually handcrafted by a robot named Giorgio, don’t be alarmed -- it’s all part of the plan.